Small dog shirts, sweaters and hoodies to fit small dogs and toy dog breeds like Chihuahuas, Affenpinscher, Bichon Frise, Boston Terrier, Cairn Terrier, Corgi, Dachshund, French Bulldog, Havanese, Italian Greyhound, Jack Russell Terrier, Japanese Chin, Lhasa Apso, Maltese, Manchester Terrier (Toy), Miniature Pinscher, Miniature Schnauzer, Spitz, Yorkie, Papillon, Pekingese, Pomeranian, Poodle, Pug, Tibetan Spaniel. Hand-knit alpaca dog sweaters with layered fringe for dogs up to 32 lbs. Hand-knit alpaca dog sweaters for dogs up to 60 lbs. Alpaca wool turtleneck dog sweaters for small to large dogs up to 60 lbs. Hand-knit alpaca dog sweaters for dogs up to 32 lbs. Alpaca wool dog sweaters in sizes to fit teacup dogs to Great Danes. Wool dog sweaters in sizes to fit teacup dogs to Great Danes. Pink leopard print dog sweaters. These skull motif sweaters are darling and edgy! 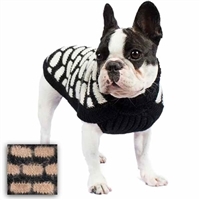 Cute zebra striped designer dog sweaters with a large hand-crocheted flower. An adorable pink and green knit dog sweater dress. A dog shirt with your pet's name in multicolor rhinestones. Sizes to fit most dogs. A dog shirt personalized with your pet's name in clear rhinestones. Sizes to fit most dogs. A Hanukkah shirt for dogs featuring a Star of David in rhinestones. Sizes to fit most dogs. A soft t-shirt for your small to large sized biker dog. A dog shirt with scattered rhinestone sparkles. Sizes to fit most dogs.